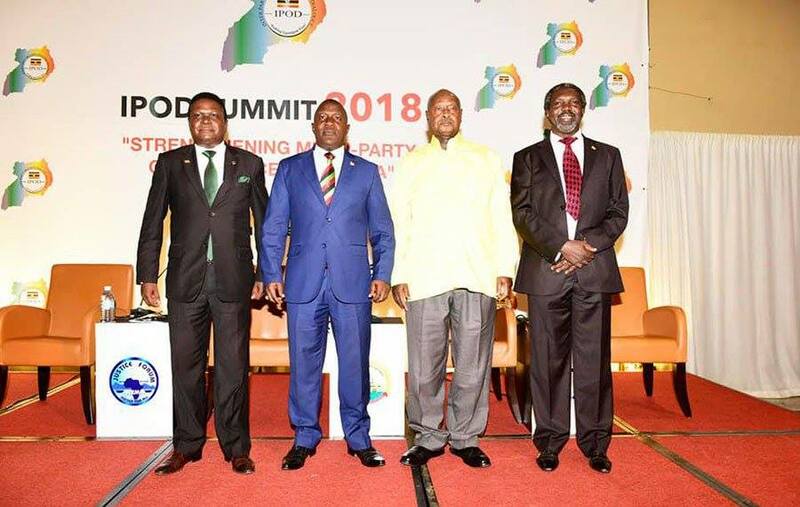 KAMPALA- The Inter-party Organisations Dialogue (IPOD) summit kicked off in Kampala on Wednesday. Founded in 2009, IPOD is a forum for leaders of political parties with representation in Parliament to engage on matters of common interest. Only four political parties are participating and these include; Uganda People’s Congress (UPC) DP, Justice Forum (Jeema) and National Resistance Movement (NRM). Norbert Mao: “Democracy starts with dialogue but does not end with dialogue. It requires action and that is how we want to be judged. This summit is not about showing a smooth surface to the world, but to ask tough questions. The challenge of IPOD now is to maintain the connection. We need IPOD to sanitize our political processes. This is a battle of ideas not egos. Politics is not about arguing amongst each other. While politicians argue, mothers and children continue dying in hospitals. Dialogue is painful because it involves talking to those we do not agree with,” he added. President Museveni: “I’m not part of those who don’t want to talk and I’ve never been. You can’t say you’re a leader but you don’t want to talk, it doesn’t mean that when you talk you agree, it means you’ve put your point across. I didn’t have to join politics, even today, I don’t have to be in politics because I have my job as a cattle keeper, I’m not a ruler. My job is cattle keeping and if you want to know, I’m the first from my family to be in government,” he added. President Museveni: “The Opposition is in danger of being whipped out because you miscalculate, you allow the NRM to be the one to solve the problems alone because you take the wrong position. What will whip you out is not that I say, it’s what you fail to do and what NRM does alone. When we succeed alone, how will you survive? Right now, Uganda is exporting more to Kenya than what Kenya is exporting to Uganda and we’re just starting, people who are worried about this started attacking Chinese and robbing them, they want them to run away but we’ve now come in and we’re going to get them. These criminals caused some casualties, they killed Abiriga, Kaweesi, the Moslem clerics but we’re going to defeat them, and when we do succeed, I’ll say I fought alone, the opposition didn’t help. In fact, the Opposition is surviving partly because of the mistakes, weaknesses and failures of our leaders who don’t implement things properly. If they did you would actually perish. I’m in this dialogue as a matter of principle and it’s so much welcome. However, the question is, what do we dialogue on? I’m surprised that some people have been avoiding dialogue which implies that there is a problem,” he added. President Museveni: I don’t need a living in politics because I’m a cattle keeper. As for Association of freedoms as raised by Hon. Asuman Basalirwa, there’s no problem in people assembling, the only problem we have is that some people decide to assemble in markets where people are selling their products. They say that some of the groups behave as if they’re on the verge of being terrorist. If you have got political actors with one leg in constitutional politics and one is in unconstitutional conduct, I’ll deal with you beforehand so that I protect the property of the people. If you want justice, come with clean hands, you can come saying you’re a Democrat on one side and a terrorist on the hand, know that we’re not fools and we know all these things. President Museveni: What forced me into politics were 2 words; Prosperity, how can our families, companies, business people be prosperous? They can be prosperous through the production of good and services. Instead of talking about tribes, religion and transition(we can have as many transitions as the years can accommodate but if we don’t deal with the prosperity of our people, Africa will be in trouble). The second reason why I joined politics is Strategic security, how can Africa be secure? By 1900 the whole of Africa had been colonized, have we solved the original problem why Africa was colonized? I’m in politics for the survival and Destiny fo Africa. Being colonized was not something nice, some of the people who were colonized perished, the people you call Americans today are actually Europeans, the original ones disappeared. We the black people survived, however, we were colonized because of the incompetence and bankruptcy of our chiefs who couldn’t organize themselves. The political class, instead of talking about Africa, you’re talking about petty things like elections.